Why do pro-family programs in Eastern Europe drive the Liberal West mad? All three of these measures make families’ lives much easier. To put this into context, as of now Hungarians pay 15% income tax (36% if you include social security + federal training fund payments from employers) and being able to get that money into your wallet for the rest of your life is a very enticing offer to have children. Although childless EU politicians hate private transport, cars are critical for the family of today. Little children do not fare buses or other public transport very well so it is fantastic that the Hungarian government actually understands this fact and wants to provide families with automobiles. This is a simple yet massively pro-family position. Regarding loans this is where Hungary and Russia align (yet again). These projects by Orban and Putin are a landmark step against the anti-family policies advocated by today’s status quo mainstream Child-Free Progressives/Liberals/SJWs. We have seen over the 20th century the total collapse of the family. The cost of this is now becoming evident as fatherless boys more often than not grow up to be useless man-babies not able to do anything for society or lean towards criminality in an attempt to imitate an MTV version of masculinity. Boys and girls need role models and sadly the television/YouTube is not a very good parent while dad has vanished completely and mom is at work. The effects of the death of the family is not just some sort of Conservative nostalgia, in fact it becoming clearly backed by statistics. For example there is a direct link between divorce and crime and about broken families being linked to the massive increase in drug abuse in the US. Some would argue that attempts to help women raise children from the government eliminate the need for men. Essentially the fear is that the government replaces the husband as the caretaker/provider which makes a traditional family impossible. But in an Illiberal context this is not the case. The means by which women could get the support they need to be professional moms comes from the resources in the country ultimately produced by men. Furthermore, these programs like the ones in Hungary and Russia should always push “marriage” as a key component of the benefits and raising children with a husband is vastly preferable to the overwhelming majority of women and even decades of Hollywood propaganda haven’t changed this. Although there is usually so much negativity and outrage in the news we can see that when governments orient themselves to pro-tradition, pro-family, Illiberal positions we can actually see society begin to heal from the mental wounds of the “Sexual Revolution”. These policies are steps in the right direction, but sadly we are still very far from being able to consider “mom” as a profession that is as important to society as cops, infantry, and doctors. When we can see right in front of our faces that a lack of parenting leads to a form of civilizational destruction that no men in uniform can stop it is time to understand that good motherhood is as important for survival of the tribe as good warriors in fancy uniforms. 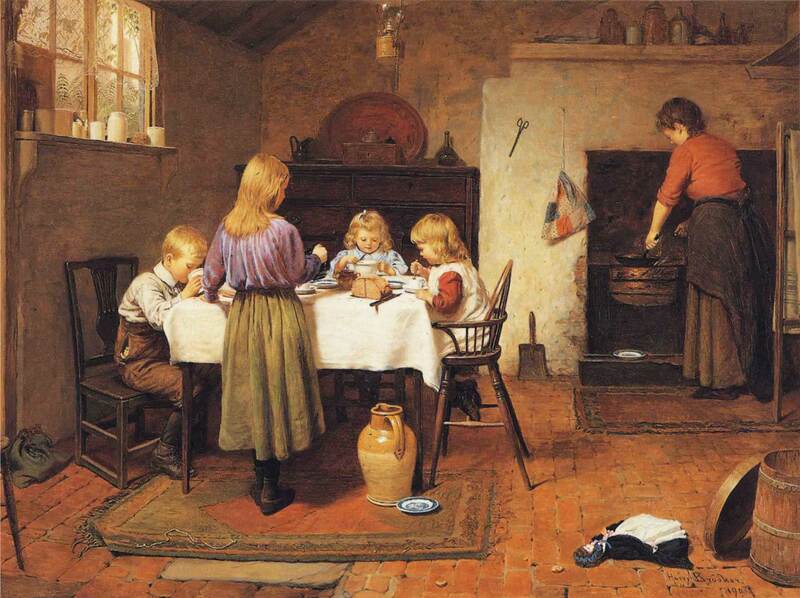 The photo shows, “Breakfast Time,” by Harry Brooker, painted 1901. This entry was posted in Features, Ideas, Politics and tagged abortion, Christianity, ethics, Family, society. Bookmark the permalink.